Because I'm one step away from needing to live in a bubble, The Remix and I don't get out much. One of our favourite things about living in Fredericton, though, is that we've been able to carve out a fairly germ-free lunch date. Mostly because there just aren't a lot of people here. Especially on Sundays when everyone's in church. 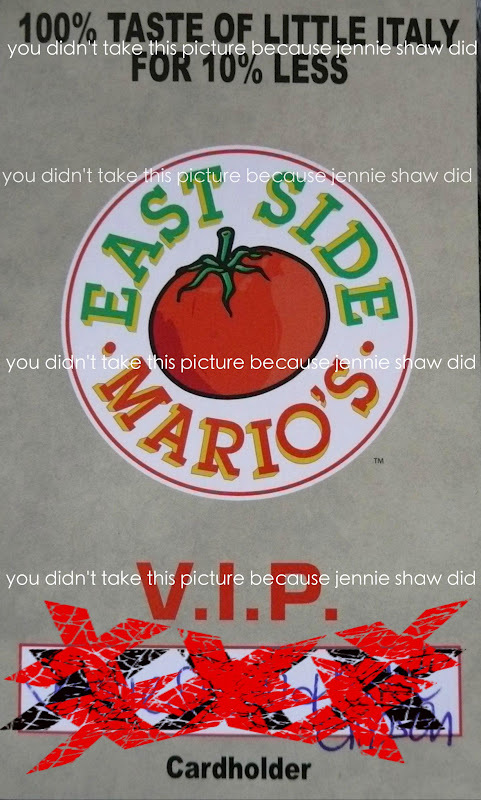 Over the last few months, we've been going to East Side Mario's. Sure, it's a big-box restaurant but we like what we like...and we like-y the unlimited caesar salad and bread, very much. Plus, there's a bar section where we can sit, away from children (who are hard-core germ-carries and need to be avoided) as well as a back booth, where nobody needs to walk by to get to their table or the washrooms. So basically, we can be by ourselves and the only germs I'm exposed to are our server's and the chef's and it doesn't really get much better than that. Last Saturday, we showed up but our regular server, Steph, wasn't working. Then we looked in the bar section and saw a staff meeting happening in our regular booth. While we hummed and hawed about what to do, one of the staff members (a guy that both The Remix and I swear we've never seen before) just happened to spot us standing by the front door, which is when The Remix whispered to me: Well we'd stay if they would get out of our table. The staff member signalled to us that he needed a minute and then he started clearing the table. We weren't totally sure what was happening but within a minute or two, the manager came over and said that "our" table was ready. Let me be clear, here...there were NO other customers sitting in the ENTIRE bar area. After joking with the majority of the restaurant's staff about whether we should be thanking them or bolting to our car from embarrassment, we settled in for our meal. As per usual, it was delicious. When the bill arrived, though, we noticed that our usual discount wasn't applied. Like I said, since we eat there every week, Steph (our regular server) gives us 10%-off. The Remix said not to worry about it but I love saving money so I wandered over to the manager to ask if we could still get the discount. She said she'd take care of it. And take care of it, she did! Not only did we get our 10% discount but then she gave us a card! With our names on it! That we can use and ANY East Side Mario's! And, to make us feel even MORE special, she told us that we're the ONLY people in the WHOLE city who have one (they're usually reserved for corporate customers). So basically...what I'm saying is...we're super important. 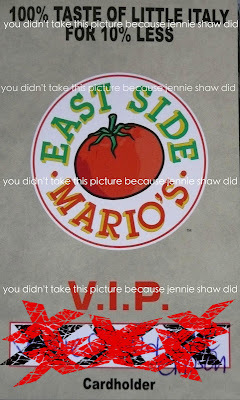 Well, at East Side Mario's, anyway, and that's good enough for us! Super nice of them to clear out of "your" table. And look at you V.I.P! Haha! Awesome! Love this story! Yay for being a VIP.